the arctic tundra all the way to Slimbridge. WWT put a totally new spin on migration with an epic 7,000km journey by paramotor from the Bewick’s swans' arctic breeding grounds back to the UK. Sacha and the expedition team flew the Bewick’s entire flyway, often at altitudes as low as 100m on a voyage that lasted three months and provided a birds eye view on the challenges facing these critically endangered birds. Once they’d safely navigated the vast Russian tundra – and its polar bears – Sacha and the team continued to track the swans’ progress through Finland, Estonia, Latvia, Lithuania, Poland, Germany, Denmark, Netherlands, Belgium and France. When Sacha completed the flight from the French coast to England, she became the first woman to successfully cross the English Channel by paramotor. Between 1995 and 2010 numbers of swans making the migration from arctic Russia to northern Europe plummeted by more than a third – from 29,000 to just 18,000. 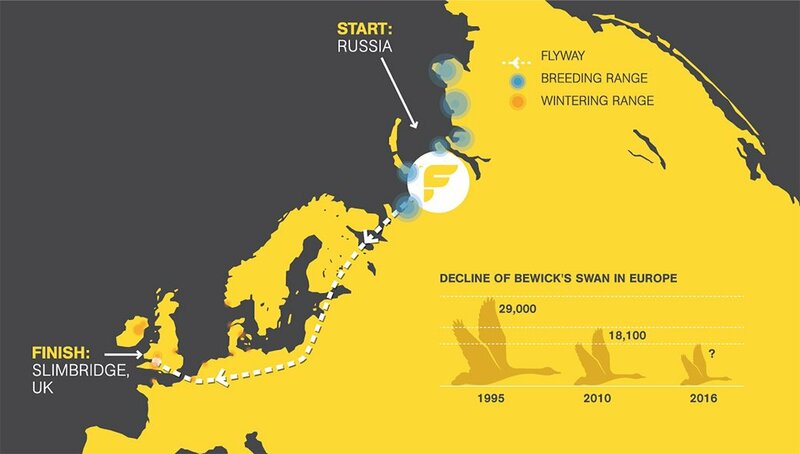 By joining the Bewick’s on their migration, Sacha and the expedition team were able to see for themselves just why swans are unable to survive the journey. Through Flight of the Swans WWT gathered first-hand evidence and information that, combined with existing research, is contributing to life-saving conservation action right along the Bewick’s migratory flyway.